This week saw Turkey officially 'launching' it's first nuclear reactor, Russian-designed, with specailly invited guest, that country's president, Mr Putin. Which in itself is quite a turn-around since it was only on the 24 November 2015 that a Turkish combat aircraft shot down a Russian jet on the Turkish-Syrian border. After this incident, President Putin spoke of 'a stab in the back by the accomplices of terrorists' and warned that it would have 'significant consequences including for relations between Russia and Turkey. And yet, and yet... two and a bit years on all is smiles and sunshine again in the relationship. What could have created such harmony from discord? And the answer, as ever in international and domestic politics alike, is money. For the Russians, the rapprochment has other strategic benefits too, yet for Turkey, the nuclear deal looks at first glance odd. But I wrote a book* a few years back about nuclear energy and in the process of researching it, I realised that with nuclear power nothing is as it seems. And in Turkey, nuclear politics is really about money. Or perhaps we should say the lack of it. Because Turkey has made four attempts to start a nuclear power program, beginning in the 1960s, and still is nowhere near to generating any nuclear electricity. The problem is not about the political will - Turkish governments whether civilian led or military-led have long hankered after the idea of being a 'nuclear power', and it certainly is not due to any respect for safety or the environment. The complete deafness to safety considerations is shown very clearly by the fact that the signed and sealed plan for Turkey's first nuclear reactor at Akkuyu Bay on the Mediterranean coast is located smack bang in the middle of an earthquake danger zone. If the plant is built (see below) and if it ever starts operating, then it is highly likely to be the first one destroyed by an earthquake. Should the Turkish government care? Yet environmental factors have always counted for little in that country's drive for hydro-electric power.. Thus, the massive Ilisu dam project on the Tigris river, was after an international outcry over the flooding of the ancient city of Hasankeyf and yet the Ilisu dam is dwarfed by the Beyhan project on the Euphrates, also in the Kurdish south-east, where fears of the forced evacuation of the local population evoke particularly bitter memories. Here an energy project is in reality part of amore sinster destruction of that much-oppressed stateless people. No, the big questionmark and problem that dogs the nuclear industry in Turkey is simply that (behind the smokescreen) both the reactors and the electricity produced are very, very expensive. Thus the only way the Turkish government can afford nuclear plants is to get outside countries to pay for them - and then let the foreign investors charge premium prices to the power consumers for years to come. A similar foolish contract has recently been entered into by the British in order to persuade someone to fund a new nuclear reactor for the UK. The UK had great difficulty persuading anyone to sink money into nuclear - but got around the doubts by making the taxpayers ultimately liable for all the risks. Alas, from the perspective of the nuclear industry, Turkey does not provide what the professionals like to call 'a secure environment' for risky, multi-billion dollar, investment. Inflation is high, the economy is in deficit each year, about half of it due to energy imports, and the country's debt is well over $100 billion. In Western countries governments change, but contracts once signed are sacrosanct. However, in Turkey, political change is more violent. There is the history of military coups d'état in recent years - in 1960, 1971, and 1980 - while the forced resignation of Necmettin Erbakan in 1997 did not do much to reassure investors either. On the other hand, the Turkish electricity sector is effectively a state monopoly, and the possibility of Turkey being allowed to join the European Union, remote though it ever seemed, barely threatens that these days, even over a timescale of 40 years which is the time-scale necessary for the moneymen who fund nuclear plants to feel confident they can make their profits. All of which is to say again that Turkey's nuclear program is about cash, not to say wheeling and dealing. The energy minister, Berat Albayrak, who is also Erdogan's son-in-law, just fancy that! called the start of work on Akkuyu the realisation of a national dream. Not to say that the vast sums of money involved in unuclear projects tend to stick to the hands of all those involved. Turkey is located at the centre of transport routes between the vast oil and gas reserves of the Middle East and Central Asia, and the markets of Europe. Logically speaking then, it would seem that the country would is in a unique position to benefit from low-cost fossil fuels, without even mentioning its own hydroelectric, fossil, and renewable energy resources. Yet somehow Turkey has ended up being dependent on cheap gas imports from Russia and Iran, the arrangements with whom (in the manner of all bargain basement deals) have in recent years proved 'unreliable'. At one point Turkey even broke off one contract with Russia, its biggest gas supplier. If the plant is ever built, Turkey will be dependent on Russian support to fuel and run it. "We have no indication that Turkey has its own nuclear ambitions. But the Turks are traders. To my knowledge they became big players in the late 1990s,"
More 'wheeling and dealing' has resulted in several cases of highly toxic nuclear waste turning up in Turkish industrial zones, apparently brought in surreptitiously in return for corrupt payments. Over the years, Turkish nuclear power projects (as with nuclear projects in many countries) have come and gone, announced with a fanfare only to disappear without trace. Yet it looks like things are more serious now. 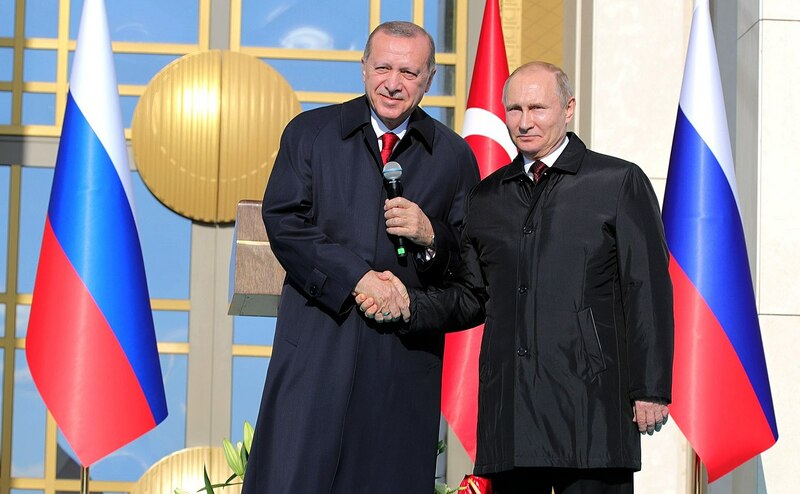 Russia’s President has promised to back the project with more than $20 billion, while Turkey’s prime minister planned to borrow another $2.5 billion on the financial markets. How can such extraordinary sums be repaid? The project represents a ball and chain being tied to the Turkish economy, a burden on the many that likewise will make the governing clique fantastically wealthy. The Turkish public are apprehensive about nuclear, looking warily over their shoulders at the plants run in Armenia and Bulgaria which are generally thought of as dangerous. And Turkey is the one of the countries which was affected by the disaster of Chernobyl, even if the accident has always been kept out of the public debate about energy policy. Instead, the discussion has been focussed on the economic arguments. But here too, nuclear power has a lot of explaining to do. Your specific discussion about energy production is a particularly interesting one. With an eye to the future, I’d like to put in a humble plug. Amid the usual chorus line of energy sources — oil, coal, natural gas, solar, wind, water, geothermal, biomass, and, yes, nuclear (fission) — sits their often-overlooked cousin, ‘fusion’. Here, cutting out many steps and ingredients, is the truncated recipe: Combine deuterium and tritium. Heat the mix until the isotopes fuse, releasing energy. Confine the process in a magnetic field. Scale it up to market levels, with energy out exceeding energy in. And, voilà, the result is a miniature ‘sun’. Sort of. Long term, fusion offers promise as a source of global energy. And there are selling points: Deuterium, available from the oceans, and tritium, from lithium, are inexhaustible. Zero carbon emissions — it’s clean. No long-lived radioactive waste — safe, nontoxic by-product. No runaway risk — unlike the Chernobyls and Fukishimas. And the production of potentially mammoth amounts of energy to fuel the world. Okay, to be sure, much hard science and engineering are still needed to nail down fusion technology, which the EU countries, Russia, China, Japan, Canada, India, Korea, and the United States are valiantly trying to do. Admittedly, the timeline is probably measured in several decades. Long term, however, fusion holds out the hope of proving transformative in energy generation. Thanks Keith, for your 'provocative' comments! I looked at fusion as an energy souce when I researched my book... I felt it richly deserved the title of 'energy myth' though... the examples offered of protypes involved more energy being put in than came out, and the costs of the processes were always astronomic. Lots of thee fake energy suppies are around: hydrogen power is one, but solar power too comes with a big questionmark - you have to factor in the energy that goes into making the chemicals and the panels, and setting them up and maintaining them... and eventually dismantling and disposing of them - and actually very little 'real' energy is produced. A tree, by comparison, is a clean and efficient trapper of solar power that stores the energy as wood. "Much underated". As to Iran and Russia and so on, I guess Pi is not really the forum for that debate, but yes, Turkey has found itself some very unreliable 'allies'. It's not the Turkish people, I am sure, but this oligrachy that has forced its way in and now runs the country - and is busy as the article says, guzzling billions of $s as ithey do so. Perhaps it's good storytelling that makes this all seem so transparent. I suspect it is transparent anyway. Why then do people act as they do? I am flummoxed. But one finds it everywhere. In philosophy they call it self-deception, and nobody seems to have answered the question yet as to how one can deceive one's own self. Perhaps our Pi author and 'resident psychologist' would have an observation? I don't think the nuclear issues ARE transparent generally though. people really beleive in the nuclear myths - which are endlessly spread by the ndustry and its supporters in the governments and media. It seems for example, that people do not understand that nuclear electricity is only a tiny proportion of energy supplies. After Fumkushima, Japan managed to simply turn off its nuclear grid! And Japan is a country that relied very heavly on nuclear for power. Secondly, people struggle to understand the invisible danger of radiation - which chooses its victims at random almost, and over a period of many years. But beyond all this are the deliberately obscure flows of money- complex financing arrangments for billions of dollars*. But the key people involved undertand them, because they end up with plenty of the money sticking to their fingers... That sounds like vague assertion, I admit, but take Japan again, where so many nuclear palnts were built despite the evident dangers. Here, the government officials and the nuclear industry leaders routinely rotate position, a process the Japanese even have a special term forit, Pi philosophers of language plese note! “Nuclear construction companies are often a kind of shell vehicle in which finance experts play with huge sums of money and different rates of interest” (p. 199). In new nuke construction “[n]o one stands to lose money–except the public, of course.” Wall Street banks including “Citigroup, Credit Suisse, Goldman Sachs, Lehman Brothers, Merrill Lynch, and Morgan Stanley–informed the US Department of Energy that they were unwilling to extend loans for new nuclear power plants unless taxpayers shouldered 100 percent of the risks,” and they got “100 percent coverage of debt at up to 80 percent of the project cost,” according to the book, The Doomsday Machine (p. 200) .